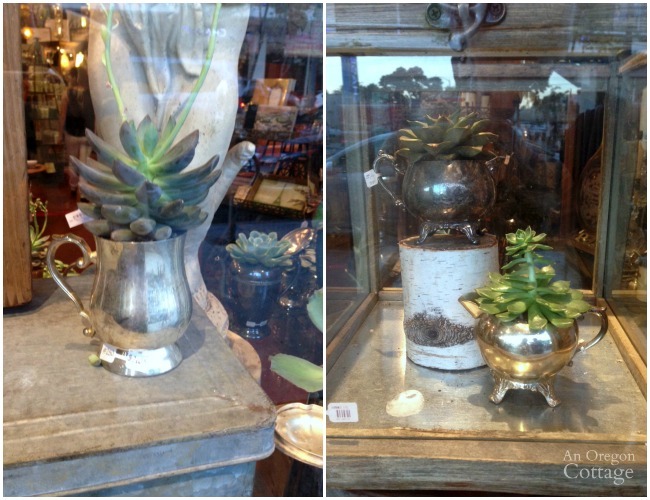 Oh, I thought I’d be sharing this great new idea for you guys – planting succulents in vintage silver containers – that I knocked off from a store I walked by in California, but I have to laugh at the fact that I’m perennially behind the times! 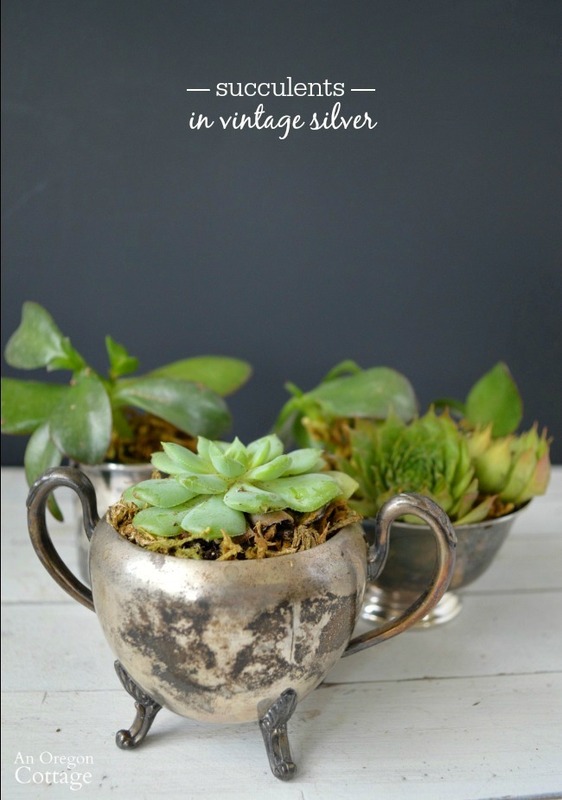 When we were in California during the summer, I saw a store selling succulents in vintage silver, loved the idea, and started planning to create a DIY post using thrift store silver for you guys. Just another thrift store transformation, right? I found some small silver containers, gathered my other supplies, put them together and had a photo shoot. 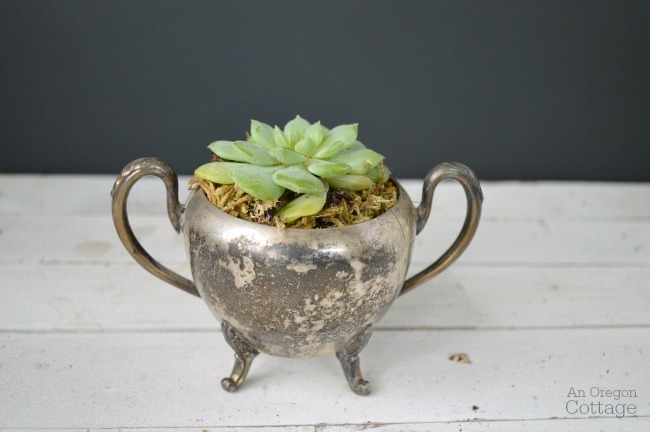 Then I go to Google, just to see what came up for “succulents in vintage silver” and, um – like way back in 2009 you can find others writing about it. Oh well, I may be late to the party, but, hey – you may be, too, and I’m in love with these sweet little guys – they are too cute! 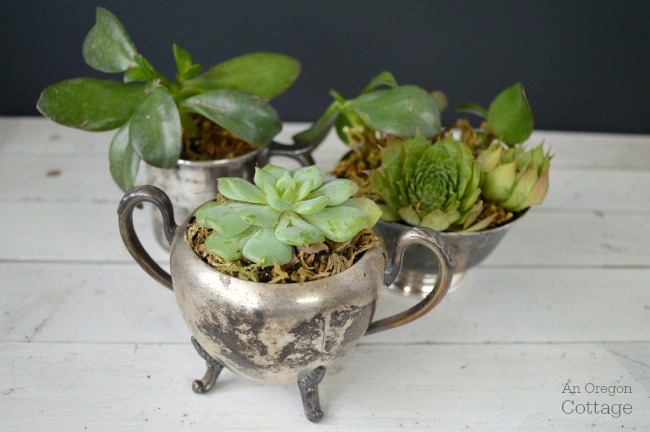 I think they would make great gifts (hostess, teacher, or birthday come to mind) and of course are perfect for so many styles of decor, since they bridge the gap between traditional (the silver) and modern (the succulents). Here are the inspiration photos I snapped with my iPhone in California and there was a lot: silver cups, creamers, sugar bowls, large tureen-type bowls, and even teapots and coffee pots. All planted with succulents – mostly single succulents, but some of the bigger items with three succulents. The prices? They ranged from $25-$60 dollars. Not outrageous (especially for SoCal), but I knew I could create versions for much less. Over the next couple months I was on the look out for vintage silver at thrift shops. I was surprised to see them selling larger silver creamers for $12-15 dollars – I really thought they’d all be under $10, since they seemed to be throw-away items that people weren’t buying anymore. For me, I don’t buy silver because of the tarnishing issue, which is why I like these – the more tarnished they are, the better! So I concentrated on the smaller silver containers, which turned out to be super cute – especially grouped together. I actually already had the sugar bowl (maybe you do, too – or your mom or grandma does…), and I found a sweet baby cup for $1.99 and a small engraved bowl for $2.99. I bought one pot of succulents at a reduced price (not sure why, they looked great to me) for $2.49 – it had 3 separate plants in one pot – and one more cabbage-like succulent (how’s that for the correct name?) for $3.99. 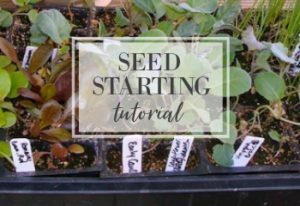 I’m sure you don’t even need a detailed how-to for this, but two things are important to mention: you’ll need to provide something for drainage and use a succulent soil mix. I just grabbed some gravel from our garden paths, since I needed so little and there was actually enough soil in the pots I bought that I didn’t need any more. 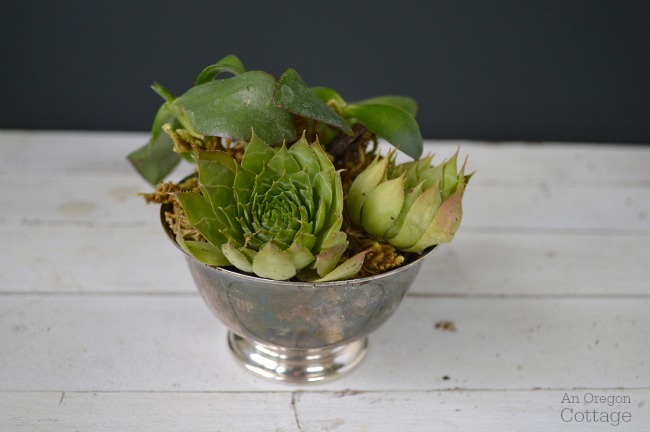 Remove the succulents from their pots, separating gently any that are planted together, place on top of the drainage material in your silver containers and fill any areas with soil. Top with moss for a finished look. I chose to use single succulents for the containers with smaller openings, but the one in the bowl didn’t seem enough, so I added a couple hens and chicks succulents I had growing elsewhere. I love how they hug the edges, especially as they opened up more later. To care for your succulents, keep in bright light indoors, out of direct afternoon or hot summer sun. Aren’t these just the sweetest things? I really love them – so even though I’m suggesting them as a gift, I’m actually keeping all of these! And they each came in under $5, so yeah, a lot cheaper than the store version. 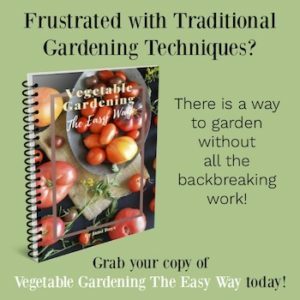 Okay, so tell me – have you seen this idea before? 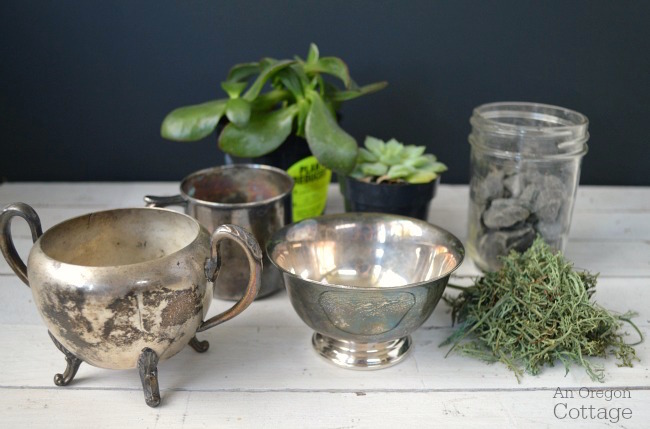 If you have, but haven’t made them for yourself (or for others, ahem), I hope I’ve inspired you to upcycle some vintage silver! 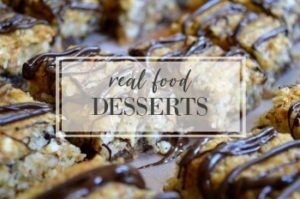 Linking to Weekend Retreat Link Party. What a clever idea, I love it! 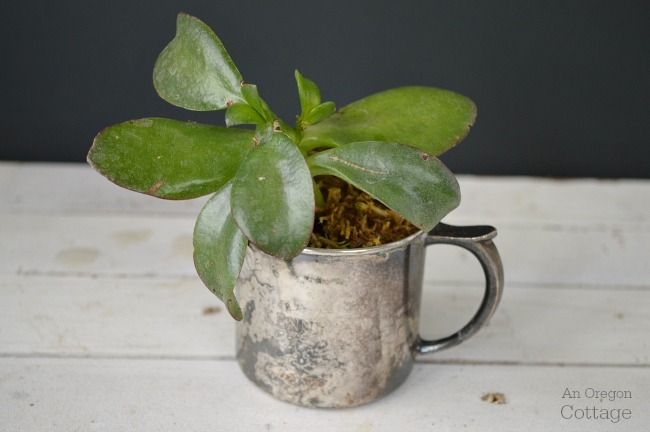 I always see these types of silver at the second hand store, and now a way to put it to good use! Thanks for sharing , can’t wait to try it. Tarnished silver is “the thing” this holiday. Personally, I wouldn’t serve food off of it. It looks good for plants and flowers. I have been buying silver plate at the thrift store. It is so cheap. It will last forever. I gave my neighbor cookies on a silver platter. I felt like a Queen walking to her house. The crazy thing to me is that the silver plate on sale at the thrift is cheaper then the plastic holiday trays that will be sold for Christmas!